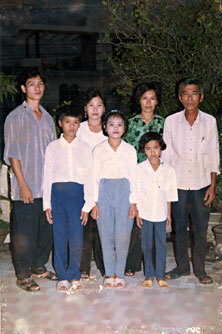 This picture was taken when Quynh's family was saying good bye to her father before he left Vietnam. Life blends with happiness and dreadfulness. Every one of us might have experienced some kind of hardships in life. Sometimes we can successfully overcome those hardships and sometimes we are still struggling and suffering, but don’t ever be despondent. No matter how hard it is, as long as you stay persistent and self-determined, you will be able to overcome those obstacles. To know who I am you must first know where I began. My life started in a small province in Vietnam which lacked freedom and opportunities for all those suffering from poverty and under control of the Communists. How did we end up in such a place you might wonder? My father was a captain during the Vietnam War on the government side. After the Communists came to conquer the nation, my father was taken into a re-education camp for six years. Upon his release and return home, we found it was difficult to live our lives. Many people would discriminate against our family, so we found it necessary to relocate our family. My parents decided to move to a small province called Dong Thap hoping to have another chance to start a new life. I was then born four years after my parents were adjusting to Dong Thap. My parents thought that if we moved to this new place it would make our life easier, but it was worse. We didn’t have enough money in our pockets to buy some property not even a small land for us to build a hut. Thanks to my grandma who gave us a small boat. we were able to live on that boat as a home. We were living on that houseboat for almost two years, driving that boat around the province. The most terrifying experience of living in this houseboat was when a storm came. Our boat was not strong and big enough to hold the storm force. The storm could have destroyed our boat at any time, but thanks to God, we survived through all storm obstacles. Even though we struggled, my family never became despondent. We worked hard and finally a year later we were able to buy a small piece of land and build a house. We’re not afraid of the scary storm any more, although we were still facing other problems. My parents worked very hard to protect my family from the criticism from other people and from the neighborhood spies. The Communists had neighborhood spies who kept their eyes on people. We would never know which neighbor was the spy. The neighborhood spy could report false information to the head of the province and we could be sent to prison. I always dreamed of getting out of that place, but where could I go? Time went by and my hunger for freedom become stronger. I kept asking my parents, “Can we go somewhere else? They nodded their heads and responded, “Go where? Just keep your mouth quiet.” From that day I never asked my parents again, but I kept thinking about this dream until one day I had good news. My father found out that former soldiers who had served in the re-education camp for more than five years were allowed to file to come to America. He was skeptical about this opportunity, but he decided to take this risk. We had to sell some of the property to pay for application fee. We waited for almost two years until we heard something from the U.S Embassy. Finally, we were asked to come for the interview. It was my happiest day, but also my saddest moment because the consulter rejected all of us except my father. My father didn’t want to leave us behind, but we asked him to leave because he could help us after he settled in America. Fortunately a year later my siblings and I were approved to join with my father. Unfortunately, my mother and my sister were rejected due to other circumstances. I then left my mother and my sister behind. The day I left my mother and my sister was the gloomiest day, one that I will never forget. Problems Continue in the U.S. Seven years ago I was new to America, a strange country but with a lot of opportunities. I left my homeland and sought to escape to America because of my hunger for liberty and for a better future. When I got here my life changed. I never knew what America looked like. All I thought was living in this place I wouldn’t have to suffer any obstacle. I thought that I was going to live a happy life. This dream was not true. My life blended with pain and tears once again. I remember going to middle school was like a horrible experience that I had to face when I first started my new life in America. It was so difficult for me to adjust to America and to the language. I told myself not to be discouraged because I left my homeland for this so there was no excuse for me to give up. At first I was excited to go to school, but soon school was not very exciting for me. Knowing only a little of English was very hard. Kids were making fun of my English. They said a lot mean things. I was hurt like a deep wound cut inside. I wished that somebody was there who would tell those kids to stop. School was hard, but teachers were not very helpful for me. Some of my teachers were tired and they didn’t have patience with me because learning was hard. I know it was hard for them, too, to repeat things again and again. I was mad at myself, too. Every time I did my homework, my tears were just dripping out from my eyes. All of my work was smeared with tears. One of my teachers asked me, “Why is your paper wrinkled?” I didn’t know how to reply because of my little English and I thought that they were not very interested and didn’t care, so it was pointless to confide in them. I cried so many nights, but I never stop working hard. I did all my work and I found my own way to get help. I was in the Bridges Program. This program helped new ESOL students with homework and to learn new things. I was lucky that I had (and still have) a wonderful mentor, Elaine Lessenco. She has been a wonderful friend to me. She helps me with my homework and she comforts my sadness. Elaine had such a big impact on me and helped me to gain confidence because I knew she was there to help me. Thanks to Elaine for everything. I successfully graduated from middle school with straight As. Seven years is such a long time, but it goes so fast. Whenever I look back at my past, I feel proud of myself. I’m proud that I didn’t let any hardships hold me back. I will be graduating from Blair in June. I’m proud of my hard work, but yet I’m still having another long hardship to go through which is to go to college. I know college isn’t easy, but I will never stop until I achieve my dreams. My dream is to become a helpful registered nurse. My motivation is to complete four years college and then go to study beyond later if I have a chance because education never stops. That was just one of my dreams. I want to have a good future and a loving family. I will rise and provide my children to become a successful person. Because of what I have been through I don’t want my children to go through my same experience. They will use my story as a role model for them to work hard and to be successful in their lives.